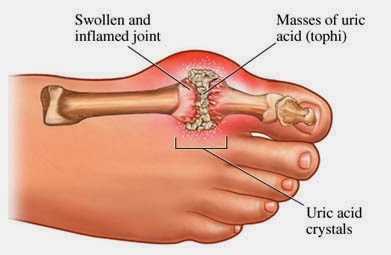 In this stage, a person has elevated levels of uric acid in the blood but no other symptoms of gout. A person in this stage does not usually require treatments for gout. In this stage, hyperuricemia has caused the deposit of uric acid crystals in joint spaces. This leads to a sudden onset of intense pain and swelling in the joints, which also may be warm and very tender. An acute attack commonly occurs at night and can be triggered by stressful events, alcohol or drugs, or the presence of another illness. Early attacks usually subside within 3 to 10 days, even without specific gout treatments, and the next attack may not occur for months or even years. Over time, however, attacks can last longer and occur more frequently. This is the period between acute attacks. In this stage, a person does not have any gout symptoms and has normal joint function. This is the most disabling stage of gout and usually develops over a long period, such as 10 years. In this stage, the disease has caused permanent damage to the affected joints and sometimes to the kidneys. With proper gout treatments, most people with gout do not progress to this advanced stage. 1. Genetics may play a role in determining a person's risk, since up to 18 percent of people with gout have a family history of the disease. 2. Gender and age are related to the risk of developing gout; it is more common in women and adults than in children. 3. Being overweight increases the risk of developing hyperuricemia and gout because there is more tissue available for turnover or breakdown, which leads to excess uric acid production. 4. Drinking too much alcohol can lead to hyperuricemia because it interferes with the removal of uric acid from the body. 5. Eating too many foods rich in purines can cause or aggravate gout in some people. 6. An enzyme defect that interferes with the way the body breaks down purines causes gout in a small number of people, many of whom have a family history of gout. 7. Exposure to lead in the environment can cause gout. Some people who take certain medicines or have certain conditions are at risk for having high levels of uric acid in their body fluids. 4. Levodopa, a medicine used to support communication along nerve pathways in the treatment of Parkinson's disease. 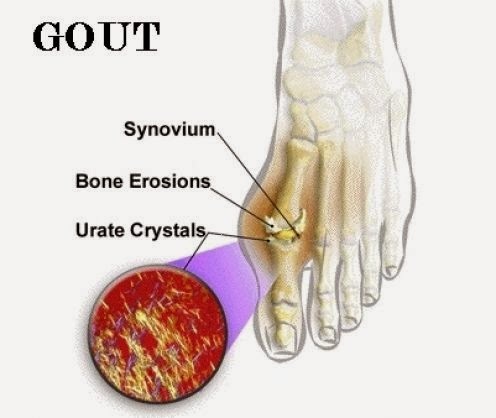 Gout usually attacks a single joint suddenly and intensely. Gouty joints show the most visibly red signs of inflammation of any type of arthritis. An initial attack of gout may last several days and disappear even if untreated. Subsequent attacks may not occur for weeks, months, years, or not at all. In severe cases, repeated attacks occurring over a long period may cause damage to the joints and loss of mobility. A definitive diagnosis of gout can be made by examination of aspirated joint fluid with a polarizing light microscope for evidence of crystals. Approximately one million people in the United States suffer from gout. It is nine times more common in men than women, predominantly after puberty with a peak age of 75. Gout attacks in women usually occur after menopause. 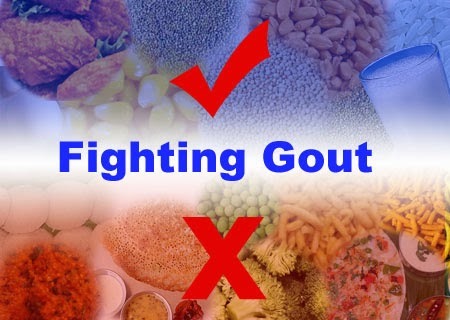 With proper treatment, most people are able to control their gout symptom and live productive lives. Gout can be treated with one or a combination of therapies. The goals of gout treatment are to ease the pain associated with acute attacks, to prevent future attacks, and to avoid the formation of tophi and kidney stones. Successful gout treatments can reduce both the discomfort caused by gout symptom and long-term damage of the affected joints. Treatment will help to prevent disability due to gout. The most common gout treatments for an acute attack are high doses of nonsteroidal anti-inflammatory drugs (NSAIDs) taken orally (by mouth) or corticosteroids, which are taken orally or injected into the affected joint. NSAIDs reduce the inflammation caused by deposits of uric acid crystals but have no effect on the amount of uric acid in the body. The NSAIDs most commonly prescribed for gout are indomethacin (Indocin*) and naproxen (Anaprox, Naprosyn), which are taken orally every day. Corticosteroids are strong anti-inflammatory hormones. The most commonly prescribed corticosteroid is prednisone. Patients often begin to improve within a few hours of treatment with a corticosteroid, and the attack usually goes away completely within a week or so. * Brand names included in this booklet are provided as examples only, and their inclusion does not mean that these products are endorsed by the National Institutes of Health or any other Government agency. Also, if a particular brand name is not mentioned, this does not mean or imply that the product is unsatisfactory. When NSAIDs or corticosteroids do not control a gout symptom, the doctor may consider using colchicine. This drug is most effective when taken within the first 12 hours of an acute attack. Doctors may ask patients to take oral colchicine as often as every hour until joint symptoms begin to improve or side effects such as nausea, vomiting, abdominal cramps, or diarrhea make it uncomfortable to continue the drug. For some patients, the doctor may prescribe either NSAIDs or oral colchicine in small daily doses to prevent future attacks. The doctor also may consider prescribing medicine such as allopurinol (Zyloprim) or probenecid (Benemid) to treat hyperuricemia and reduce the frequency of sudden attacks and the development of tophi. Acetaminophen ( brand name - Tylenol) or other analgesic painkillers - for pain. NSAIDs (nonsteroidal anti-inflammatory drugs), more specifically indomethacin (brand name - Indocin) - for inflammation. Colchicine - prevents or relieves gout attacks by reducing inflammation. Corticosteroids - for anti-inflammatory response. Probenecid (brand names - Benemid, Probalan) - to decrease uric acid blood levels by increasing the excretion of uric acid into the urine. ColBenemid (other brand names are Col-Probenecid and Proben-C) - contains Probenecid, a uricosuric agent, and Colchicine, has anti-gout properties. Allopurinol (brand name - Zyloprim) - to lower blood uric acid by preventing uric acid production. Allopurinol blocks the conversion of purine in foods to uric acid. Febuxostat (brand name - Uloric) - lowers serum uric acid levels by blocking xanthine oxidase. Losartan (brand names - Cozaar and Hyzaar) - not specifically a gout medication but is an angiotensin II receptor antagonist, antihypertensive drug that may help control uric acid levels. Fenofibrate (brand name - Tricor) - not a specific gout medication but it a lipid-lowering drug that may help uric acid levels. Gout has the distinction of being one of the most frequently recorded medical illnesses throughout history. Researchers are working on the development of more effective gout medications. To help prevent future attacks, take the medicines your doctor prescribes. Carefully follow instructions about how much medicine to take and when to take it. Acute gout is best treated when symptoms first occur. Tell your doctor about all the medicines and vitamins you take. He or she can tell you if any of them increase your risk of hyperuricemia. Plan followup visits with your doctor to evaluate your progress. Gout Diet: Maintain a healthy, balanced diet; avoid foods that are high in purines; and drink plenty of fluids, especially water. Fluids help remove uric acid from the body. Exercise regularly and maintain a healthy body weight. Lose weight if you are overweight, but do not go on diets designed for quick or extreme loss of weight because they increase uric acid levels in the blood.